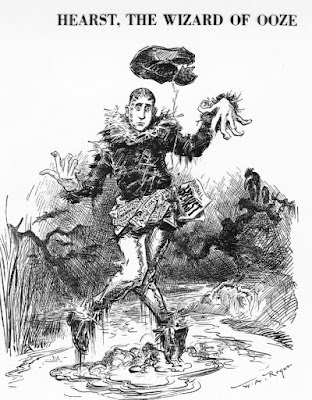 March 10 1909 -- Herriman adds color to a review of the play "The Moment of Death, or The Never, Never Land" by Israel Zangwill, playing at the Orpheum theatre. The play explores the idea that pivotal moments in a person's life are replayed over and over as they die. Is there a wiki or database which lists the Newspapers which specific comic strips were published? Often I read your posts and set up to find more examples of a strip you posted and have no idea which newspapers to check for more examples. Not really Mark. 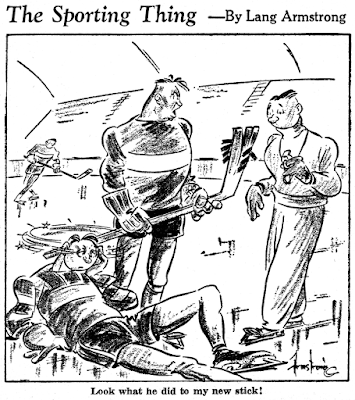 Early strips can normally be found in their home papers, obviously, but from the 1920s on, even features distributed by a specific newspaper often don't appear there. There's a fellow on rec.arts.comics.strips@googlegroups.com who often posts about the contents of various newspapers. You may be able to reverse search with the copious info he has posted. 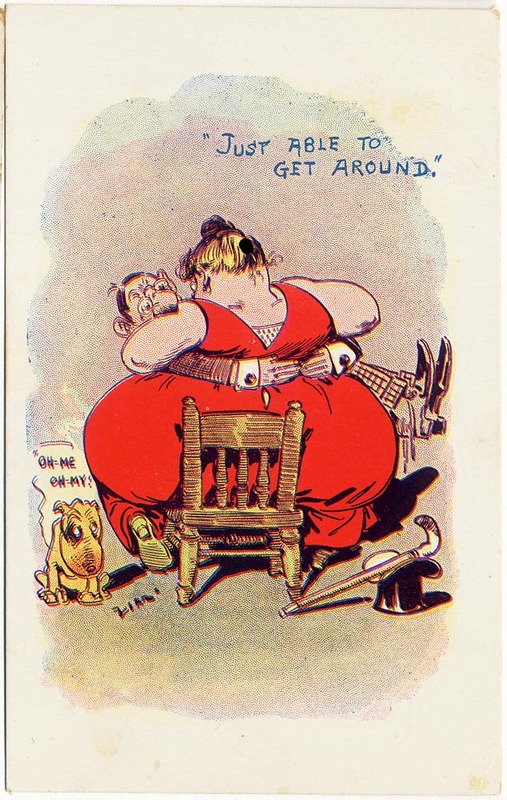 Here's a Zim postcard published by H.G. Zimmerman of Chicago. Like another example from that maker we've shown here, this one has off-register colors, lending it a blurry look. The reverse I find very sad. This card was sent anonymously, with no message, to Miss Cora Ackley of Martinsburg Ohio. According to the Find A Grave website, Cora was a 32-year old spinster at the time she was sent this card. If I was her, I'd take this as a not too subtle message that she was too portly to attract a man. Rumors of an impending upheaval in journalism grew as the presidential campaign progressed. For several months, intimations of strange developments in the New York field had been dribbling to newspaper workers in the hinterland. They revolved around stories of a fabulous personality. William Randolph Hearst, publisher of the San Francisco Examiner, had invaded Manhattan with a trainload of gold. He was the son of the multimillionaire, George R. Hearst, United States Senator from California, who died in 1891. He had bought the New York Journal from John R. McLean for $180,000 in cash. Countless instances of his freakish extravagance were recited. They sounded like episodes in a modern version of The Arabian Nights. Most of them illustrated a contempt for monetary costs. Hearst would double an editor’s or a reporter’s salary as readily as he would light a cigarette. His journalistic prodigalities had driven other New York publishers to the verge of panic. The sleazy trade papers then serving the Fourth Estate gave little insight to the actualities. They reflected the views of Hearst’s metropolitan competitors. His splashes in the newspaper ocean were the antics of a sailor on a spree. “Willie off the yacht” would eventually stop splurging. John R. McLean had done very well with the Enquirer in Cincinnati, but bucking New York publishers with the Journal had reversed his peristaltic processes. Hearst’s intestinal experience would run a similar course. But the amusing freak turned into an ominous menace. His stunts, novelties and news enterprises set New York newspaperdom on end. His circulation rocketed. He added an evening edition. The Journal was the only New York daily to champion Bryan for the presidency. On the day after the election—fourteen months after its acquisition by Hearst—it announced the largest sales ever made in one day by any newspaper—more than 1,500,000 copies. Then appeared the bogeyman of journalism. Hearst now was held forth as an instrument of destruction. His prodigal methods would wreck the newspaper business. They made profitable publication impossible. It was lunacy to believe a one-cent daily could survive the enormous expenditures they imposed. Hearst’s own losses proved this. They were easily calculable. To break even, he must double and perhaps treble his advertising revenues. To meet his competition, established newspapers would have to do likewise. That was hopeless. Such a volume of advertisements was beyond the limits of imagination. True, Hearst’s operations in the one-cent field were confined to New York. But if he did succeed—if his money bags did hold out—his success would mean the elimination of competition. The next step would be the installation of his program in other cities. It would be introduced by him or by imitators. Eventually, there would be only one daily in each community. Thus, three of the four current St. Louis newspapers would disappear. So, three-fourths of the working newspapermen of America must regard this man Hearst as their arch-enemy. He threatened their jobs and their livelihood. This was not a whispering campaign. It was a jeremiad that arose in newspaper counting rooms across the country. Its doleful burden was passed on to editors and reporters in mutual commiseration. Soon the picture of Hearst became to thousands of journalists the visage of an ogre. So it remained through at least two decades, during which he did more than any other man to raise the rewards and multiply the opportunities of newspaper workers. A considerable part of the bias against him, that later extended in many directions, is traceable to the incongruous antipathy instilled by envious and shortsighted competitors among the group most directly benefited by his activities. The specter raised by the Californian’s critics was in reality the monitor of an economic revolution already well under way. The industrial element that touched the daily lives of more people than were reached through any other outlet of enterprise was passing into a new phase. The newspaper was turning from circulation to advertising for its major depot of supplies. Hearst was by no means the inventor of the new system. He merely accelerated the transition. Its progress is best shown in a fifty-year arc. In 1880, readers contributed approximately 56 percent of the total incomes of American publications. By 1930, this percentage had been reduced more than one-half. That year they furnished less than 26 percent and the advertiser something in excess of 74 percent of the newspaper revenues. Price increases later modified this ratio; but the advertiser continued to contribute fully two-thirds of the publisher’s receipts. The ultimate outcome of the changed order was to requisition and develop a new type of managerial talent. Operation of a newspaper became a dual function. Essentially, it consisted of the acquirement of circulation and the sale thereof to advertisers. Success depended on the degree of simultaneousness with which these tasks were performed. Each paper was produced at a cost far in excess of the price paid by the purchaser. So, each additional reader enjoined an additional expense. Added circulation must be promptly translated into increased revenue from advertisers. The editor could no longer, individually, assure the success of a newspaper. The more brilliantly effective his work, the greater became the need to expand the volume of advertising sales. Formerly, the space salesmen, under a department chief, were directed by a business executive. Now the advertising manager outranked the head of the counting room. He was the platinum-haired hero of “his end of the shebang.” He was the fellow who brought in the cash to meet the bills that everybody else in the organization piled up. And he had to do it all alone. The cooperation he got from the editor could be hidden under a hummingbird’s eyelid. Somebody had to keep preened the advertising manager’s peacock feathers. At the same time, the sacredness of the editorial sanctum must be preserved. A coordinating officer must step in. Here was a job that demanded extraordinary talents. The incumbent should be master of every patois and idiom in the province of journalism. To him the esoteric symbols of all departments of newspaper-making should be as simple as elementary principles are to a savant. He should have the finesse of a diplomat and the finality of a field marshal. He should have the patience of a philosopher and the driving power of a dynamo. Given these qualities, he could keep yoked in efficient teamwork the strongly individualistic temperaments that almost invariably mark those who achieve divisional chieftaincy in successful newspaper work. Such an official must absorb all the responsibility and all the command necessary for unimpeded direction. So came into the field a new type of publisher. Whether he fulfilled the requirements of the leadership he assumed, or whether he fell short, he became helmsman of the craft. Thus is explained the eclipse of that glamorous functionary— that epic figure that reigned over the heyday of personal journalism— the editor who was the sole boss of the shop. His exit was a sluggish anticlimax to the stirringly dramatic story of his supremacy. He was eased out. The door closed slowly but firmly behind him. Fire-eating thunderers of the type of Horace Greeley, Joseph Medill, Henry Watterson and their ilk were shouldered away from journalistic preeminence by masters of a new technique. The dominance of an overshadowing personality was subordinated to institutional prestige. The editorial page became merely one phase of a vastly expanded service of fresh tidings supported with a limitless variety of auxiliary elements. The personal despotism of the philippics gave way to the constitutional monarchy of the news. A paradox followed this revision of journalistic methods. The reader’s importance expanded at the same time that it diminished. While his stature declined as a “cash customer,” his potentialities grew as a stimulant of advertising revenues. A new entity arose. Actually imponderable, it became the most ponderous factor in the development of the Fourth Estate. For lack of a more impressive designation, it was labeled “reader habit.” In truth, it constitutes two-thirds of the stock in trade of the newspaper field. It is the vitalizing essence of the institution from which it derives its existence. It is the hub around which revolve the concentric forces of the press. Comprehension of this phenomenon may be quickened with a fanciful analogy. Let us, for that purpose, transform a publication into an imaginary theatre. The reader is now a spectator. The management has set up a novel course of procedure. It charges only a nominal admittance fee. It draws the major share of its receipts from the sale of concessions—exhibits to be shown during intermissions. When these privileges are likened to the advertising space in a periodical, the comparison becomes concrete. Various elements must enter into computation of the rates the concessionaire should pay. Foremost is the size of the audience (the amount of circulation). Next would be the time and space consumption of the display (the linage or area occupied). Then would come the quality and extent of the entertainment furnished (the nature and range of the service with which the family of readers is attracted—the published contents by which may be gauged the calibre of reading faith engaged). Also would be considered the regularity of attendance (the degree of continuity of interest). The chief commodity of such a theatrical enterprise would be practically identical with the chief commodity of a modern newspaper—a recurrent assemblage of attention units—“attendance custom” in the theatre; “reader habit” in the publication. Continued increase of the commercial implications of journalism engendered various theories of operation. There were publishers who simplified the process by treating the advertisement as a by-product. Unfortunately, few of them carried this view to a logical conclusion. Many raised the subordinate function to major importance. Often, the vending of space dominated the other processes of publication. Constant vigilance is indispensable for the retention of this objective. Its inexorable necessity was admirably stated by Joseph Pulitzer. “Let the editor be like a priest in the pulpit,” he admonished. Pulitzer sensed not only the spreading intrusiveness of the advertiser, but also a growth of mercenary opportunism within the publishing circle. His proposal was, in effect, a sacred trusteeship of the soul of newspaperdom. My own understanding of this philosophy was given lasting point by a caustic comment from Joseph B. McCullagh. The incident followed an overweening adventure in phraseology. The national Woman’s Christian Temperance Union had met in St. Louis in annual convention. 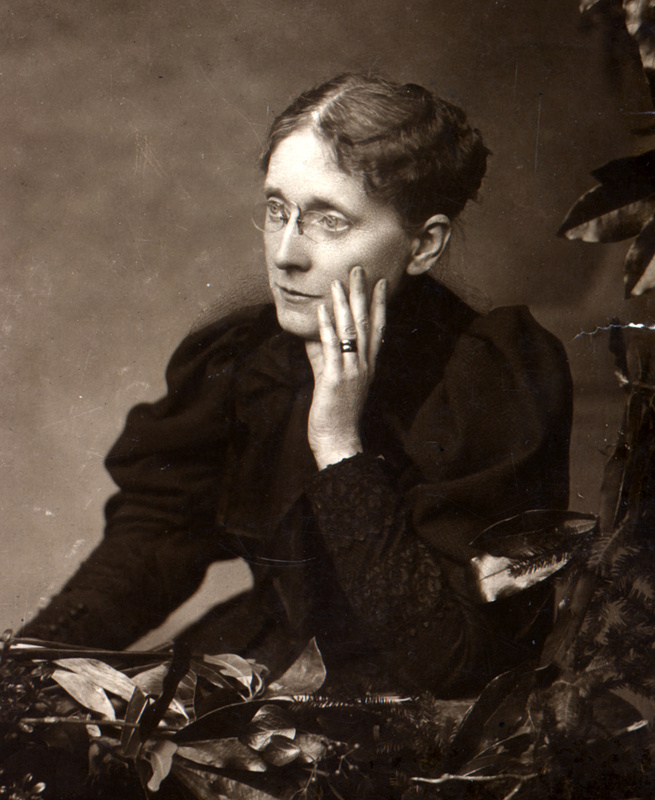 The delegates were in high spirit over the presence of their beloved leader, Frances E. Willard. Her appearance on the presidential dais was the signal for a scene that lifted me out of reportorial reserve. It was my first view of the Chautauqua salute. Seven thousand women, their faces alight with emotional exaltation, waved their white handkerchiefs in rhythmic salutation to the little figure standing alone in the center of the stage. The demonstration continued for more than a quarter of an hour. It set up a ferment of unfamiliar feelings. To that must be attributed the precipitation of verbiage that cluttered my story of the gathering. Still, there might have been no repercussion, except for one phrase—“psychic pulchritude.” That was just too thick. It landed me “on the carpet” in McCullagh’s office. One of the great editor’s idiosyncrasies was his personal aloofness. Few men caught his eye. He affected constant absorption in reading. No matter how distinguished his visitor, an open newspaper served as a screen between them. And his callers included men of great eminence, among them a vice-president of the United States. This remoteness was sustained by McCullagh’s manner of enunciation. His words were shorn of the fulness that tongue and teeth could have assured. Each syllable depended wholly on labial formation. The effects of artificial distance were heightened by McCullagh’s parsimony in diction. He was an outstanding master of laconism. “Did you write the Frances Willard lead?” he asked without prelude. Up to that moment, there had been no intimation whether approval or censure awaited me. Nevertheless, real misgiving attended my confession. “Never write to please the writer,” McCullagh snapped. “Write to please the reader.” The cryptic judgment left me standing open-mouthed. “That’s all!” crackled across the newspaper in McCullagh’s hands. The obligation of a newspaper to facilitate its reading is paramount. Clarity is no less important than authenticity. The reader must never be left in doubt. His comprehension must be considered with the same solicitude that is accorded to his convenience. Conflicting news or views must not be presented without ample editorial warning and advice. The publication’s dependability may be gauged by the adequacy of that guidance. “Easy to read” is a pledge covering substance as well as form. There is nothing altruistic in this program. It sets the stage for a system of social and economic collaboration. It assures the maintenance of a public domain the existence of which has remained practically unrecognized. It not only outlines requirements for efficient operation, but it also defines duties of an extremely profitable business partnership. The publisher undertakes to supply the day’s news at a rate so low as forcefully to emphasize the need for additional or collateral compensation. The purchaser of the newspaper pays a consideration largely in excess of the labeled price. The pennies he tenders are merely tokens of a preliminary payment. They are warrants of the reader’s time and attention—vouchers for the collection by the publisher of larger sums from the advertiser. The transfer of the packet of printed words is only a step in the development of an immensely valuable equity. It expresses a tacit agreement—an implied covenant. To question the mutuality of this quasi-contract would be to set a premium on fraud. Real as well as ethical claims accrue from the purchase and reading of a newspaper. A salable asset of great worth is evolved from the efforts embraced in the time and attention that the buyer has been induced to contribute. Under the doctrine of quantum meruit—the owner’s entitlement to a fair value for his property or service—the reader has definitely earned a quid pro quo. “The laborer is worthy of his hire.” It would be fatuous to suggest that this could be readily convertible into substantial means. Yet, gossamer as it appears on cursory observation, it incloses the corporeal structure of an equitable lien. In certain conceivable contingencies—such as carelessness or deliberate deception on the publisher’s part—it would justify actions in tort— suits for damages untenable on any other basis. Meanwhile, it establishes the subscriber in tenure of the newspaper’s preponderant obligation. Here is the anomaly of a major indebtedness that resolves itself into a major credit. The capital it represents is equivalent to the revolving funds employed in the collection and distribution of news. Its maintenance and growth are coextensive with that public domain which, preempted by the press and its patrons, long remained terra incognita to its occupants. In short, it is that cultural sphere of actual and potential rights which are here designated as the reader’s estate. This is a dominion of inestimable importance. Its constituents furnish the force on which journalism must rely for its existence. They are, in fact, that force itself. They supply the vital fluid of newspaperdom—circulation. But the reader’s estate enjoys powers beyond those conferred by physiologic phenomena. It derives authority from selective practices. It functions through diurnal elections. By affirming to some and withholding from others the approval of purchase, its electors decree the success or failure of daily newspapers. By this process are guided the main currents of public thought and taste. And by this process has been developed that system of interchanging compensations and obligations under which the Fourth Estate became joint tenant with the reader’s estate. Except where they are without opportunity for selection—situations to be discussed later in these pages—the purchasers may not disavow their approval of the publications they support. Their patronage of a newspaper is a mandate for the continuance of its policies. The reader shares the publisher’s responsibilities. A sign of refractory influences brewing in the Fourth Estate came from a self-constituted committee of reporters headed by Eugene Katz. They were intent on forming a trade union. Some time before, I had succeeded in organizing the St. Louis Press Club. Katz and his associates believed that this work qualified me for their leadership. It was impossible for me to conceive a more unworthy objective than the leveling of the mind to the plane of the muscles. That was the only basis on which journalism could be reduced to identity with a labor union. A wage scale could fit only those circuits of service in which an equitable average of earnings may be computed. Metering standards must be available for such calculations. They were at hand in all quarters of manual production. But how could the output of talent be metered? How could the mystic flights of the brain be matched with a schedule of dollars and hours? How could a fixed rate of payment be tabulated for performances as variable in value as the gifts of providence? The committee felt that what was good enough for a union printer was good enough for them. They’d be very happy to be as well fixed as the compositor. Not one of them earned as much as a typesetter with a regular situation. Their comments betrayed naive notions of certain newspaper realities. In this they shared a characteristic not uncommon to the craft. Nor was this at odds with another distinctive trait—that delicately balanced skepticism which guides the resourceful news-hunter—a masterful superiority which often turned into a bald gullibility in the precincts of personal concern. Many a reporter, known as a “hard-boiled egg” outside the office, reverted to a chickling in shop affairs. This occupational vagary was symptomatic of conditions peculiar to journalism. The quale of this phenomenon permeated the newspaper establishment. It reached from the reportorial entourage to the publisher’s aerie. It widened the cleavage between the individual and the institution. A speck on the background of a highly specialized industry ultimately grew into a cloud that overcast its pursuit. One of the earliest corollaries of this obscuration was the appearance of the so-called “efficiency expert.” His engagement was construed among the rank and file as a confession of the employer’s deficiency in leadership. At least, it betokened proprietorial neglect in the training of competent and trusted lieutenants. Ordinarily the summoning of detached assistance to solve management problems would signify a critical exigency. Such was actually the condition that here and there inducted “efficiency crews” into publishing plants. Oftener, the procedure was a covert subterfuge. In some cases it merely masked an avidity for larger profits—a program providing neither reinvigoration nor expansion of service. In other instances it served as an expedient to transfer to outside shoulders the blame for a staff shake-up. Almost invariably it was attended by a decimation of long-time employees. This method of bloodletting left a trail of distrust and resentment. It injected into the esprit de corps an allergy for anemia. It generated currents of yearning for employment stability. The blight in the wake of an “efficiency crew” also aggravated a notorious grievance. It made more poignant the consciousness of compensation inequalities. The newsroom, without which there would be no newspaper, was generally the center of a false economy. Its functions initiated all the processes necessary for the manufacture of a daily publication. Each working unit added to the existent staff would therefore entail increased outlays all along the line of production. Here, then, was a brake—a species of automatic control—for every mechanical expense arising between the raw material and the printing press. The prudent proprietor never relaxed his curb on the editorial payroll. Growth of the news budget was nevertheless inevitable. A constantly recurring squeeze play developed between the publisher’s restrictions and the editor’s requirements. It checked any tendency toward a general advance in individual remuneration. The additional funds that were provided went almost wholly into augmentation of personnel and facilities. The extra dollars that were available for recruits were seldom accompanied by extra dimes for veterans. The result was the maintenance of a highly unfavorable standard of earnings in the editorial department. In point of nature and quality of service rendered, it suffered by comparison with every other division of newspaper work. George Langford Wainwright “Lang” Armstrong was born in Edmonton, Alberta, Canada on October 27, 1906, according to a family tree at Ancestry.com. His parents were Walter Michael Armstrong and Mayme Wainwright. The 1911 Canada Census listed Armstrong and his parents in Alberta. His father was in real estate. 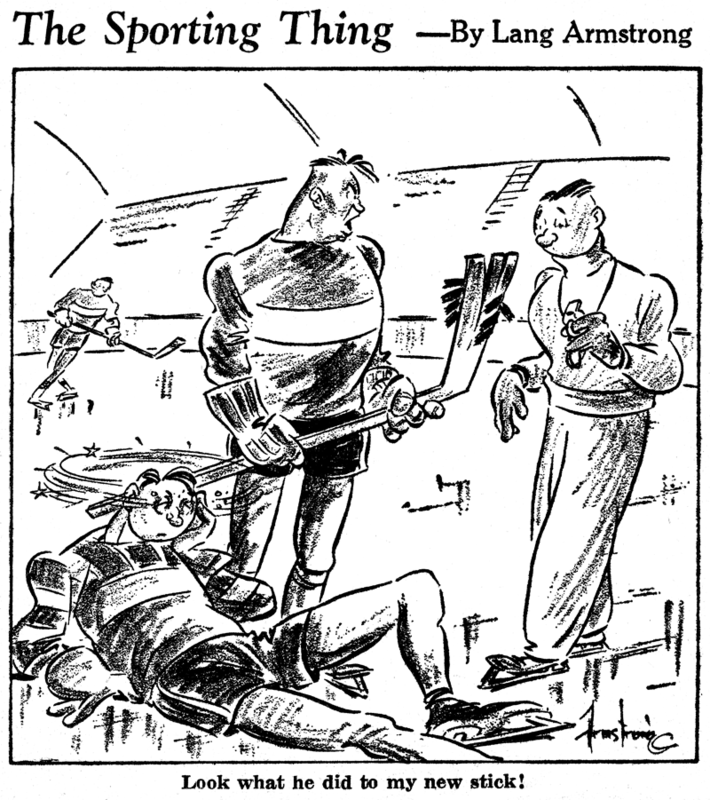 The Edmonton Journal, September 10, 1940, said Armstrong attended the Alex Taylor School. According to his mother’s U.S. naturalization application, she was a British national and emigrated to the U.S. at Eastport, Idaho on October 28, 1922. The Armstrong family settled in Spokane, Washington later that year. Armstrong attended Spokane’s North Central High School. The January 1926 school yearbook, The Tamarack, said he was president of the Art Club. 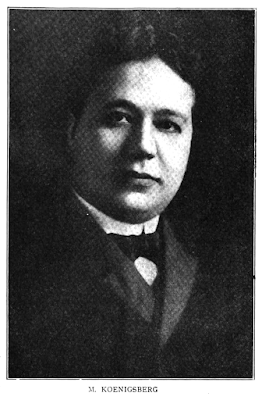 Armstrong was class treasurer in the June 1926 Tamarack. He was art editor on the Tamrack staff when he graduated in January 1927. While a student, the Edmonton Journal said Armstrong was a copy boy for the Associated Press in Spokane, and later became an evening telephone operator for the Spokane Daily Chronicle. A year later he joined that paper’s art department starting as an errand boy. 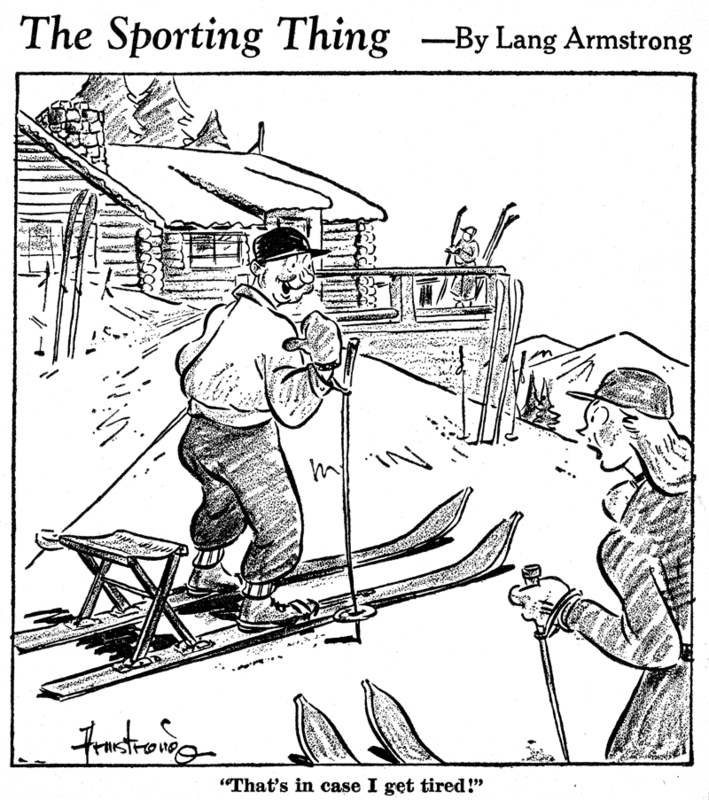 The Spokane Review said Armstrong joined the art department July 26, 1927 and named staff artist in 1935. 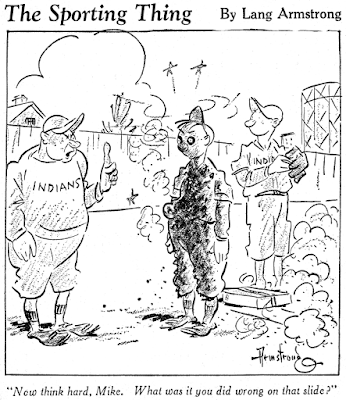 The 1930 U.S. Federal Census recorded Armstrong as a newspaper cartoonist in Spokane on East 7th Avenue. His mother was a nurse and his father retired. Armstrong married Lucille Evelyn Brown in Spokane on November 28, 1935. A 1937 Spokane city directory listed Armstrong as a cartoonist with the Spokane American Engraving Company. He resided at West 1029 1st. 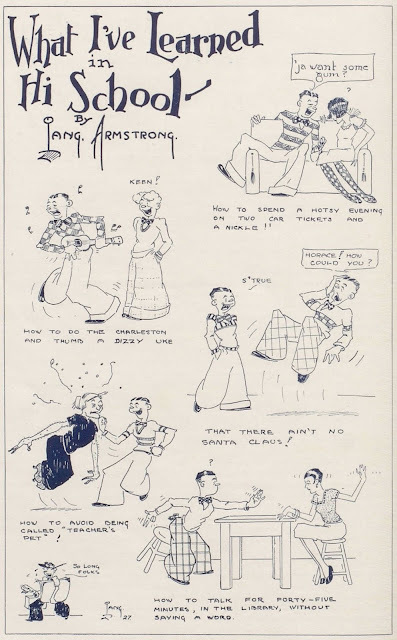 Beginning in 1937, Armstrong produced the panel Stuff and Things for the Chronicle. 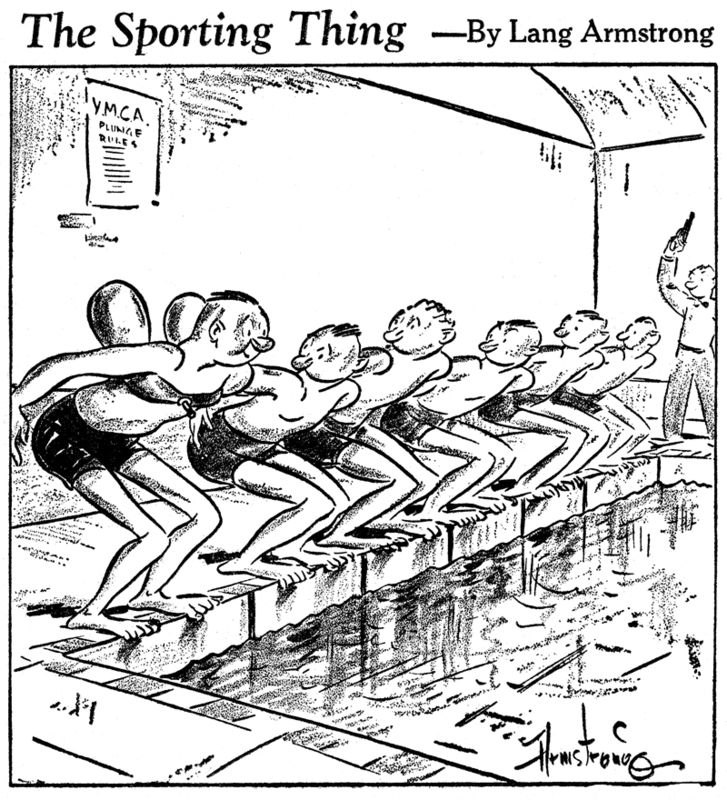 American Newspaper Comics (2012) said Bell Syndicate in 1939 syndicated his The Sporting Thing. Cartoonist Armstrong’s address was 11 Cedar in Spokane as recorded in the 1940 census. During World War II, Armstrong enlisted in the army on September 2, 1942. The Spokane Review said Armstrong served with the Army Air Corps intelligence division at Kearns, Utah. He was discharged September 14, 1943. Armstrong returned to the newspaper. On March 1949 Armstrong was named manager of the art department then head of art services in January 1962. He was a founding member of the Spokane Press Club. Armstrong retired on October 31, 1968. Armstrong passed away February 23, 1983, at his home in Spokane. He was laid to rest at Fairmount Memorial Park. I tell ya, it's tough being a half-wit. I've long admired the beautiful brush-work and liveliness of the art on The Sporting Thing. I marvelled over how the same guy who was such a consummate animal artist on Uncle Wiggily could also have such a deft touch with more mature humor and in such a very different style! Of course, there's a good reason for that. They're two different guys. 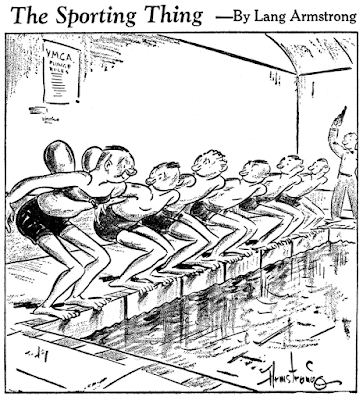 The creator of The Sporting Thing is Lang Armstrong, and the illustrator famed for Uncle Wiggily is Lang Campbell. You can imagine how balled up I get with all the Williamses and Smiths in the cartooning fraternity. 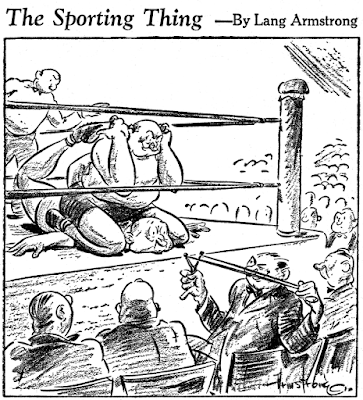 Anyhow, let us not focus on my stupidity, but rather the underappreciated wonder that is the work of Lang Armstrong. The Sporting Thing debuted via Bell Syndicate around September 1939*, and was Armstrong's first syndicated work. He had been working at the Spokane Chronicle since the late 1920s, and had a local daily panel there titled Stuff and Things that had been running since 1937. They were both gag panels, but The Sporting Thing was (obviously) sports-oriented, while Stuff and Things used any general gags he could come up with. 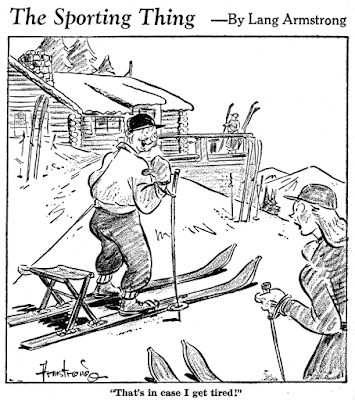 Armstrong continued producing his Stuff and Things cartoons for the Spokane Chronicle while he was also producing the syndicated The Sporting Thing. Because the Chronicle didn't take his syndicated panel, he often let a Sporting Thing gag do double duty as a Stuff and Things cartoon, but by no means always. Despite the excellent work he did on The Sporting Thing, which featured lovely grease-crayon cartoons and very playful gags, the panel did not really catch on. 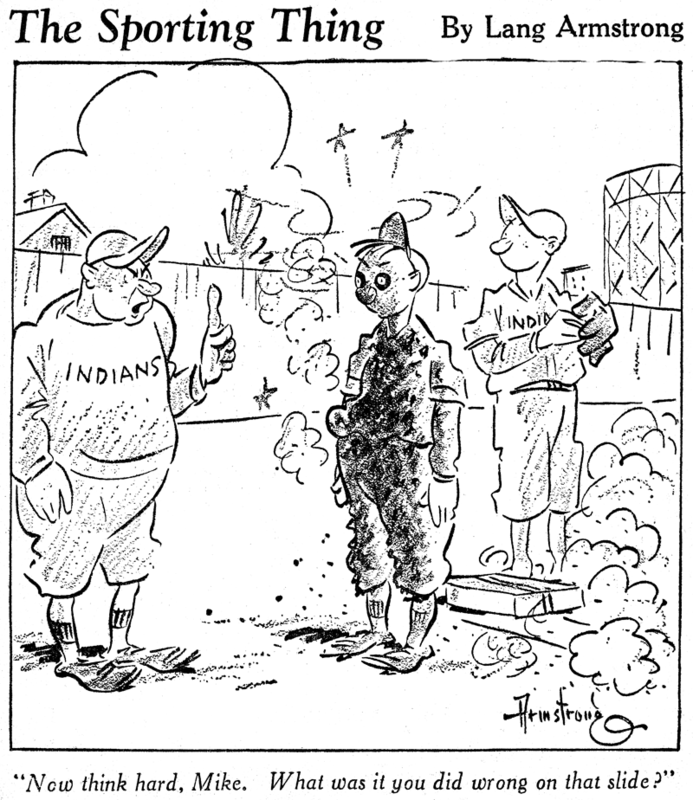 As natural as it seems to have a daily sport-oriented cartoon for a newspaper's sports page, the idea never seemed to really take hold. I'm guessing that the sports editor would rather run an extra action photo than a cartoon in his limited space. The few papers that did take The Sporting Thing almost all ran the panel ROP, fitting it in if and when they saw fit. In December 1945, Bell Syndicate** finally accepted Armstrong's Stuff and Things panel for syndication, and around that time reduced Armstrong's space, previously two columns, to a single column width for each feature. Considering that a main attraction with his work was the lush grease-pencil, that was a really dumb move. His panels now looked totally generic, and destroyed the nice playful feel. Armstrong gamely produced both panels until sometime around March 1946. Neither panel was by any means setting the world on fire, so he opted to continue only Stuff and Things, retiring The Sporting Thing after about six years in the big leagues. Stuff and Things didn't outlast it by long, ending in December 1946. For some samples of Stuff and Things, and an obit of Armstrong, go check out Ger Appeldoorn's post at The Fabulous Fifties. * the Minneapolis Tribune advertised that the panel would begin there on August 14 1939, but then they never actually ended up running it. So, huh? ** In my book I credit not Bell Syndicate but Lloyd James Williams for the syndication. That is because I saw his copyright on a panel, while Bell Syndicate never to my knowledge put their copyright slug on it ever. However, Bell was the distributor of record in the 1945 E&P listing, so I'm guessing maybe Mr. Williams was some sort of impresario, a la Stephen Slesinger. In 1939, the panel's only other appearance in the E&P listings, only its Canadian distributor, Dominion News Bureau, was listed. Reuben “Rube” Grossman was born in New York City on April 22, 1913. His birth date was recorded in the Social Security Death Index, and his birthplace was determined from census and marriage records found at Ancestry.com. Grossman’s parents were Benjamin and Ida Lindenburg who married in Manhattan, New York City on June 26, 1910. According to the 1915 New York state census, Grossman, his parents and older sister, Jennie, resided in Manhattan at 209 East 99 Street. Grossman’s father was an operator in an unspecified trade. In the 1920 U.S. Federal Census, the Grossman family of five remained in Manhattan at 200 East 97 Street. Grossman’s parents were Russian emigrants. His father was a tailor. The 1925 New York state census said Grossman, his parents and three siblings lived at 65 East 98 Street in Manhattan. The 1930 census recorded the Grossmans in the Bronx, New York, at 602 Prospect Avenue. Information regarding Grossman’s education and art training has not yet been found. Who’s Who of American Comic Books 1928–1999 said Grossman was doing advertising work from 1930 to 1934. From 1934 into the early 1940s, Grossman worked in animation. Grossman was on the staff of Fleischer Studios in New York. Grossman was in the 1937 photograph of a bachelor dinner for Nick Tafuri which was printed in Leslie Carbarga’s book, The Fleischer Story (1976). The caption misspelled Grossman’s first name as “Ruben”. Two Fleischer cartoons Grossman worked on were Aladdin and His Wonderful Lamp and Gulliver’s Travels. The studio produced a newsletter, Fleischer’s Animated News. Issue number six has a cartoon by Grossman in row three, column four. Grossman married Rita Davidson in Manhattan on November 25, 1937, according to the New York, New York, Marriage Index at Ancestry.com. The 1940 census named the couple as residents of Miami, Florida, at N E 82nd Terrace. Grossman’s occupation was artist in the motion picture industry. Two Miami city directories from 1941 and 1942 listed Grossman as an artist at 1263 SW 21st Terrace. Grossman was also producing funny animal material for comic books. Around 1942, Who’s Who said Grossman was worked in the Sangor Studio for about two years. The bulk of Grossman’s comic book work was for DC Comics from 1940 to 1962. Two complete stories by Grossman are here and here. Many of his comic book credits are here and here. Grossman attended the 1945 DC Comics Christmas party. American Newspaper Comics (2012) said Grossman drew the Rudolph the Red-Nosed Reindeer for King Features Syndicate which ran the holiday season strip from November 19, 1951 December 24, 1956. It was written by Robert L. May. Grossman drew the Little Davey Jones coloring book, and collaborated with Larry Nadle on Little Chrissy Tree, and with Seymour Reit on Name-A-Grams. Manhattan city directories for 1949 and 1953 listed Grossman at 20 Monroe Street, and the 1957 and 1959 listings had 475 Franklin D. Roosevelt Drive. Who’s Who said Grossman returned to the animation field in the mid-1950s, first in commercials then in cartoon series such as Felix the Cat, and The Mighty Hercules. Grossman passed away August 29, 1964, in Sherman Oaks, California, according to the California Death Index. The New York Times, August 31, 1964, published an obituary. A few additions based on only on my memory - I'm the source for most, but not all, of the Grossman credits in the Bails, etc. Who's Who. Grossman. Grossman went to Florida with Fleischer Studios, and returned to NYC, with the closure of the Florida studios. In Florida, Jay Morton had fellow Fleischer employees do comics, that he sent to Ben Sangor (and Richard Hughes) for publication in Ned Pines' comics and I believe Sangor's own ACG. Grossman nicely signed his work. When the studio return to NY in early 1943, Grossman went to work shortly for Dell (in Animal Comics), and then DC where he continued to work till the mid-late 50s or so *. I suspect Sy Reit wrote the Rudolph comic strip, as he was writing the DC Rudolph annuals at that time, and the strip (or at least the one year that I've read) featured characters created in the comic. 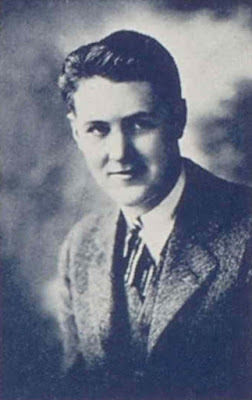 Robert L. May created and owned the rights to Rudolph, but isnt known to have written more than two Rudolph stories (one published after his death). * New material continued at DC up to 1960 (Rudolph), but most of the late 50s material seems to be inventory work.